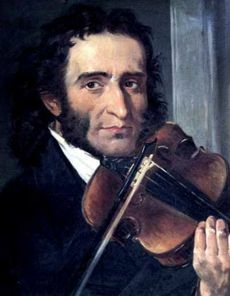 Niccolò Paganini (1782-1840) was an Italian violinist and composer. He was one of the most famous virtuosi in musical history. Paganini was born in Genoa, Italy, on October 27, 1782. His father taught him to play the mandolin at the age of five. He started with the violin aged seven and was composing his own works before the age of eight. Studying in Genoa and Parma he made his first concert tour at the age of thirteen. Like many early prodigies he had difficulties coping with his fame and at the age of 16 was gambling and drinking alcohol. However, under the guidance of an unknown wealthy lady he was rehabilitated and also added the guitar and viola to his repertoire. At the age of 23 he became music director at the court of the Princess of Lucca, sister of Napoleon. Five years later he started touring round Europe; visiting Vienna, Germany, Paris and Britain. It was performing his own works that won Paganini international renown. He had an extraordinary range of technical mastery and played with a verve and intensity that many people believed him to be inspired by the Devil. He refused to publish much of his work during his own lifetime and some of his scores were only discovered in the second half of the twentieth century. Owing to ill-health caused by a life of carnal excess, he was forced to reduce his public appearances after 1834. He died from throat cancer in Nice at the age of 57 in 1840. Orchestral: 6 violin concertos - the first of which is the most popular today - about 12 variations for violin and orchestra, and miscellaneous pieces. Chamber: many sonatas for violin, guitar, violin and guitar (duets in all but name) guitar quartets, variations and other compositions. Instrumental: the amazing 24 Caprices for solo violin; and other works for solo violin and guitar. Vocal: Some songs and duets. This page was last modified on 16 July 2016, at 01:40.